It is my pleasure to welcome you to this timely and important webinar on Land Rights for Slum Dwellers in the East Indian State Odisha: Making technology work for the urban poor, which is co-organized by o-organized by the Government of Odisha, Tata Trusts, Azim Premji University, Cadasta Foundation, Tata Institute of Social Sciences (TISS) with support from the NRMC Center for Land Governance and the Land Portal Foundation.. It is my honor to moderate this forum. Odisha is one of the major states of India, urbanizing at a fast rate. As per the 2011 census, while the total growth rate of population for the state over the past decade was 13.97%, it was 26.8% for the urban areas. Much of this high urban growth rate is due to the migration of poor people from rural to urban areas in search of better livelihood opportunities, and this also contributes to the growth of informal settlements or ‘slums’. This increasing slum population poses high demands on the urban local bodies to provide land for housing and basic services. Lack of legal land tenure has a detrimental impact on their overall quality of life. Without a certificate of residence, they are barred from getting loans for starting businesses, accessing basic services or finding a formal job. In August 2017, Government of Odisha enacted landmark legislation the “Odisha Land Rights to Slum Dwellers, Act 2017” to enable identifying, securing and transferring of land rights to slum dwellers in all municipalities and Notified Area Councils (NACs). In all stages of the project execution, advanced technology was used to bring in ease of doing this accurately, create transparency in the process, remove discrepancies, reduce the dependency on human interventions and bring in speed in execution. While mapping was done through Unmanned Aerial Vehicles (drones), data collection was done through GIS and digital based applications, and the project was managed through digital networking. This is perhaps the first time that UAVs and other technologies are being used to create high-resolution maps of slums and a household database at such a large scale in India. 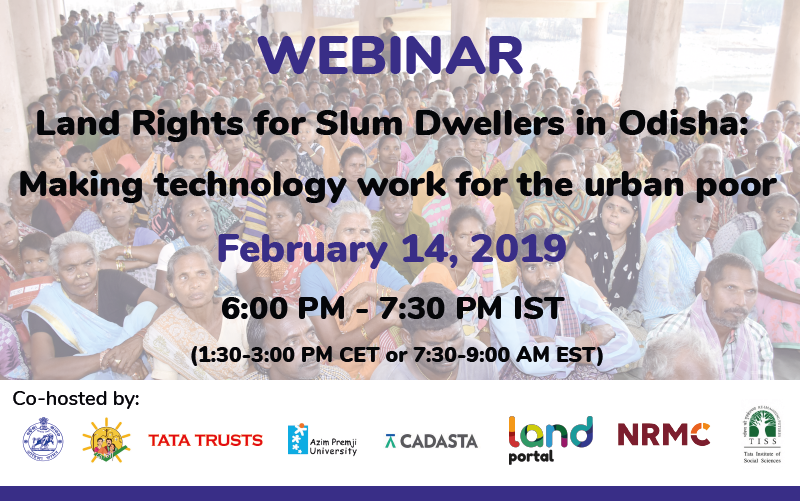 The objective of the webinar is to discuss this project, application of innovative technologies, processes and partnerships in the its execution and best practices followed in confering rights for slum dwellers. This webinar will broadly cover the evolution and context of Land Rights Act 2017 in Odisha, the application of innovative technology and how this was done, partnership, capacity building and strengthening local institutions, and also good practices and research opportunities that have come out of these efforts. We encourage participants to ask questions. Please use the questions feature to pose questions to the panelists. We will ensure that your questions are addressed in turn during the open discussion that follows. Let me ask the first question to Mr. G Mathi Vathanan. What is the context and ultimate objective of the Act? Is the project limited to only provisions of land rights or also considering improvement of living standard of slum dwellers? Odisha state, which is located in the eastern part of the country, is urbanizing at a very fast rate of 26%, with more than 23% living in these slums, that is the informal settlements. Lack of land tenure and the unauthorized occupation of government land and the primacy of getting housing assistance from the government and other basic essential civil ·····infrastructure, amenities and services, which otherwise are available from the authorities. Apart from that, the slum dwellers always live with a fear of demolition, eviction from their housing and habitats. Realizing the significance of their contributions to the cities’ very existence as well as to the growth of the city, given the fact that they provide all the labor, and are the main labor force, necessary for the functioning of the households as the city life, Odisha state government has come out with a landmark and historic act - The Odisha Land Rights to Slum Dwellers Act in the month of August 2017. The act confers the land right to slum dwellers on a insitu basis. That is, wherever they are residing, in terms of tenable land. For untenable lands, such as forest , rangelands or other lands that cannot be settled, they will be located in a new habitat in a nearby vicinity acceptable to the community with their full consent. The act covers 109 towns, all the medium and small towns of the state, having more than 2,000 slums, with more than 200,000 households, but affecting a population of about 1,000,000 people. We are in the process of issuing land rights, and already more than 40,000 land rights have already been distributed. By this month’s end (the end of February 2019), we intend to give 60-70,000 land rights certificates. Some of the slums are in untenable lands, which cannot be settled with the dwellers, as they are forest lands or other protected lands. There are 668 such slums. They will be moved to new habitats with tenable land status where land titles can be given to them. In the process of implementation of the act, conferring the land rights certifications, we realized the team that was implementing this program, that new land rights won’t be able to make much impact in their living standards unless we work on a dedicated mission unless we work to upgrade the housing and the other civic infrastructures available. Hence we conceptualized and we rolled out the mission, called the JAGA mission, to transform the slums into livable habitats, which will have all essential civic infrastructure, amenities and services. The JAGA mission is now in operation in all the urban areas of the state, amounting to about 3,000 slums. That will benefit about 350,000 households and a population of 1,000,000. We are hopeful that apart from the land rights certificates the comprehensive upgrading of infrastructure should transform the living environment. How the project will contribute to inclusive development? Prof. Amita Bhide, how do you think that the project will contribute to inclusive development? For the entire idea of inclusive development, the challenge is not just in addition but is in the rest of the country as well. This is roughly 20% of the urban population.There has been no justice done in most of the cities in India. There are two kinds of considerations that are being taken in this current step. When is challenges to inclusive development and how they can be Incorporated. The second is looking at the future of opportunities. And the future prevention of slum formation as well. Both of these packages need to be included if one is talking about inclusion. The second thing that needs to be dealt with as the fact that there are two separate pathways that are fragmenting cities in India, one in in which formally planned city, and the other other city, which is considered to be one of encroachers and illegals, so this act and the mission actually gives them land rights with made them formal citizens of every city. This is an extremely crucial step because, when you consider the importance of tenure and its linkages to all the services. It will mean that slum dwellers don’t just get access to any services, but they have the right demand services on parity and in comparable terms. The next issue is that of land rights, which are different than housing rights. Housing rights entitle you to a structure. Land rights are also intergenerational. Land rights give freedom to households to construct their houses in the way that they desire and can afford to, and there are considerable possibilities of coming together on their own terms. This is a crucial step. Another dimension of land rights is the intergenerational dimension. This means that the gains to be had are not just limited to the first generation, which is currently staying in these slums. These are also gains that will be passed on to the younger generation and the next, as these land rights are also heritable. In several cities of India one has come across the experience that slum dwellers are given certain services and rights, and often they are reversed by other policies that enter into force. But land rights are irreversible. One then moves onto how these acts and the mission are being seen. It is not just the giving of one paper that says you are being given a land right. The JAGA mission then moves on to create livable habitats, so that is the vision that has been laid before us. This means that having started with land rights, you will add new layers of development to it by participatory budgeting experiences, improving infrastructure and having norms with a minimum level to which every person staying in an urban area will be entitled, which makes no difference between a slum dweller and a formal dweller. This participation and this orientation are the elements which make inclusion equity-oriented. In many parts of India, inclusion is seen a limiting agenda. The way that this is being envisaged in the case of Odisha is that you begin with land rights, you begin with inclusion, but you are moving far beyond to orient the city towards inclusivity. What type of innovative technology is adopted? Thank you Prof. Amita Bhide. Frank Pichel, what type of innovative technology is adopted in the project for slum mapping, data collection and networking? Thank you for that question. It’s an interesting one, because it’s I would say that it’s not the technology itself that I see as the biggest innovation. You know, we’ve seen many of the tools we used applied on projects around the world, UAV imagery, GIS and cloud computing, the use of satellite imagery or smart phone applications. What made the project a success was, in part, using technologically appropriate tools in combination. We’ve all seen that technology in and of itself can be useless without that government support. So, before giving any credit to technology it’s probably better to give the first credit to the governance structure and the work that the state did to not only get the Act passed, but to get buy in from all levels. Now, as we look at the technologies that were used, there were a number of core tools. First was the extremely high-resolution drone imagery of 3-5 centimeters, and that really contextualizes the area. As Mr. Mathivathanan said earlier, the ability to access the slums using traditional methods and getting to the corner point of a building that abuts another building isn’t really possible in the tight confines of an urban settlement. The drone imagery made it possible to digitize the boundaries in a way that is more participatory and inclusive with the community. I think we all would agree that looking at a list of coordinates does not mean too much to most people. And a survey plan to the average person is just a polygon existing in a blank space. But when you come and have your rights documented and can physically see the boundaries as they appear on the ground, then it becomes very clear that your rights were recognized accurately and appropriately. There’s a lot more trust in the process. In addition to the drone imagery, using mobile technology and mobile applications from ESRI and Cadastate that are simple yet powerful enough to allow members of the community themselves to become data collector was key, as was the trust by government that these local citizens are best placed to capture the information. It’s the members of the community who really have the trust and the knowledge, etc. as compared to an outsider coming in who perhaps isn’t know, trusted or understanding of the local context. Being able to use a simple, easy to use technology to collect data in the field by members of the community was extremely empowering. That data is of course still reviewed and validated by the land professionals, so we know it meets the necessary requirements for recognition of the rights. So in addition to the drone imagery and mobile applications from Cadasta and ESRI, the ability to quickly communicate with the field team via a common tool that most everyone probably knows - Whatsapp - helped allow for very real time communication. Because it’s a tool that the data collectors and members of the project and members of the community are already used to, there’s no need for additional training, there’s no additional complication, it just allows for efficient exchange of information in real time. Finally integrating all of the data into a GIS, and allowing data to be shared, analyzed and contextualized with other historical data layers ensure that the state government is efficiently managing data. So, it’s this combination of tools that allowed a tremendous amount of work to be done in a very short period of time. What are the partnership and capacity building strategy adopted? Shishir, let me ask you this question. What are the partnership and capacity building strategy adopted by the project? The project adopted multi-stakeholder partnership strategy from the beginning. Each slum community is mobilized to form a Slum Dwellers Association (SDA). SDA drives the entire process right from identification of the slum boundaries to household level survey till the time land rights is given to the beneficiaries. About 27 NGOs were partnered with for data collection at the field level and validation and about 600-700 field facilitators were hired for the same. Global partners like Omidyar network for funding drone survey in 12 districts of the slums, Cadasta Foundation for data collection through GIS based application and Norman Foster Foundation to support in providing indicative designs for slum upgradation under Liveable Habitat Mission. National partners like Sparc Pvt Ltd, Transerve Technologies and Jurong Consultants Pvt Ltd. were brought in for conducting drone surveys of the slums and linking of the data in the GIS. Capacity building programs were organized for 2700 stakeholders in one of the fields to familiarize with the key aspects of Act and implementation process based on learnings from the pilot. About 600-700 field functionaries were trained in different batches at district and regional level and were given hands on experience of the field. Apart from the training and capacity building exercises, the team from the Trusts was based in the field on need basis to provide on- hands support in the entire process. Why were drones used for slum mapping? Mathivathanan, Why were drones used for slum mapping? How has it helped in avoiding large-scale dispute and confusion? Drones were used for geo-fencing of all the slums through aerial survey and producing ortho maps. The ortho maps captured the minutest of the details of the slums like streets, trees, area of land occupied by households and open spaces etc. Ortho maps are 95% accurate in terms of measurement of the area of the land occupied under the whole slum and land occupied by each household. Drone survey helped in mapping of the slums with accuracy within short period of time which would have taken more time if would have been done manually and there would have been scope of human errors during measurement. It helped in identification of the houses which were built in one night to avail the benefits as they were not captured in ortho maps. So, it helped in avoiding such confusions on the field. This helped in producing accurate maps for each slum which was never mapped before. The ortho maps were integrated with the existing cadastral maps and revenue RoRs to identify the revenue plot on which these slums got established and whether it is tenable or non-tenable. The revenue department had maps which are decades old and have not been replaced ever since. This process provides a database of maps to the government. As the mapping will result in giving rights to people, accuracy is very important, as well as the public perception about this survey process. The public perception of the scientific basis of the survey, giving no scope for human intervention and manipulation, that has taken away the complications and conflicts in the minds of the people. Professor Bhide, do you think that the spatial and household data collected in the project can be utilized for future research and evidence base? There are different kinds of data that have been collected and which will be generated in the future.One is the entire spatial and social data that is being collected, which in respect to all the slums which are being given land rights and which basically means all slums in the state of Odisha. I think this kind of exercise of social and spatial mapping does not exist anywhere in the country done on a comprehensive basis. It is very critical not just as baseline data, but also to understand what is the nature of slums, what is the relationship between slum and the people, what is the the relationship between living and life within the city. The second kind of impact is really the entire data which will then be provided by the settlement profiles which are going to be generated as part of the JAGA mission. Therefore, this JAGA mission data and through the settlement profiles launches us into another aspect, which is in terms of thinking of what kinds of programs and prioritization is done by slum dwellers. At the city level, what are the dynamics which accrue in converting different settlement action plans and how they converge at the city level. What is the role that particular services have and how do they impact the quality of life for different ranges of people? Thinking about services provided to slums, the next question is how is the relationship between the slum and the city actually transformed? Is it impacted in any way? There are multiple questions which one is able to see. The final thing that I would also see is in terms of looking at services, at service level benchmarks and the information that has been provided by the Ortho maps, which talks about tenability, non-tenability, and all of these issues are highly contested issues with respect to slums in certain cities. Who decides tenability for example? Are there objective parameters of tenability? So when we look at services, are there going to be norms and standards for those services. The experience often has been that the service provision to slums is often bereft of any kind of monitoring standards, construction standards or maintenance standards. So this is really going to be a completely different experimentation in documentation as well. It opens up opportunities for asking new research questions an engaging and contributing to dynamics of how slum dwellers take charge of their own agency, the possibility that participatory processes generate and finally how the state systems respond to those participatory processes. Frank, What are the research opportunities from this project? The project presents a myriad number of research opportunities! A key area of interest for us at Cadasta is the impact of intermediate forms of tenure and bringing citizens into formality for the first time. Ultimately does this change the relationship between citizen and state, as citizens that were previously informal now have a right to demand services and recognition. What is the effect on broader family relations? status of women in the society and family as the land rights are issued jointly in the name of husband of wife. Mission innovates at multiple levels, hence interesting to document and evaluate what worked, what didn’t. The pattern of settlements in different slums based on their location and proximity to infrastructure, industrial areas etc. The ability to provide services based on the data captured – better able to do so? More cost effectively? What are the best practices adopted and learning? Shishir, What are the best practices adopted and learnings from the project? Intensive capacity building was undertaken with hands – on training to the field functionaries and government officials in the field. Use of technology like using drones for slum mapping, data entry in app helped in speeding up the process and scaling up the project across 30 districts on time.The use of technology also helped in curbing the leakages at different levels in the system. The convergence happened at different levels at state and district to complete the task of providing land rights and work order under housing scheme on time.